State Government will utilize the expertise of Amity University scientists to experiment Piroformospora, multifunctional Fungus, in demonstration farms to enhance the yield of fruits, vegetables and crops and make an action plan for the implementation in the farms. It’s discloses in the meeting between Chief Minister and Padamshri K.S.Bains, IAS (Retired), Director General, Training and Development, Amity University and Prof. Ajit Verma, Director General, Institute of Microbial Technology of the same University, after they gave a detailed presentation over the subject. As Himachal is India’s biggest Apple produce state and many of its plants have already come to its age so that this new fungus will support to prolong the age of old apple root stock and additionally increase the yield. Dhumal added that the multifunctional fungus Piroformospora had successfully been experimented in Punjab and other States and it can also be good for the farmers of Himachal Pradesh as well. He directed the authorities to constitute a team to interact with the experts as also organize awareness camps of progressive farmers to prepare them mentally to experiment the fungus in the farms on priority. This Fungus will experiment on priority in Lahaul valley where the cropping season was likely to start very shortly with the melting of the snow. Dr. Ajit Verma detailed the components of the new innovative fungus and the results visible on the ground as experimented in different parts of the country. 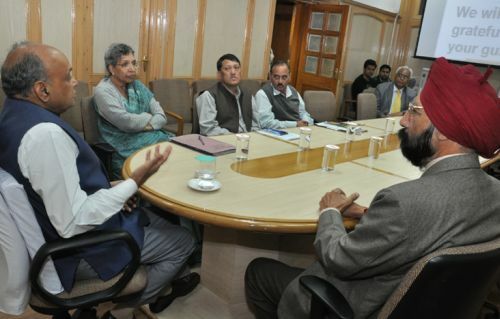 He said that the fungus could be of immense use to the farmers of Himachal. He offered his services to the farmers for implementation in the fields.